For anyone who struggles when it comes to daily devotions, At the Feet of Jesus extends an irresistible invitation to set aside your duties and find the amazing peace and incredible joy that come from time alone with Him. 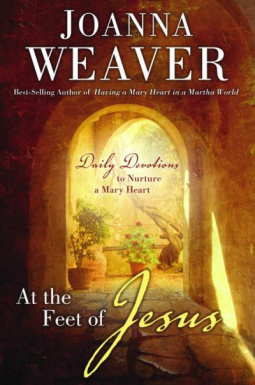 Drawn from Joanna Weaver’s beloved Bethany trilogy, each reading in this 365-day devotional includes a Bible reading passage and reflection question. All-new material and “Going Deeper” sidebars are also woven throughout. Discover for yourself the riches that come from spending a portion of each day alone with God. At the feet of Jesus—where true life begins!